We're pleased to have Jodi Meadows join us with her latest novel THE ORPHAN QUEEN, the first book in a duology. 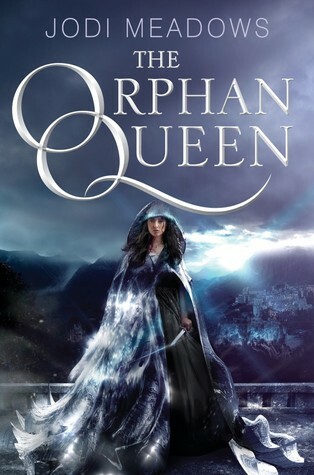 Jodi, please tell us about your inspiration for writing THE ORPHAN QUEEN. The idea that sparked the entire book is actually a huge spoiler, but I can tell you that it's in the last third of the book. It's a flashback section that begins "I was there when the war began." Fun(?) fact: that used to be a prologue, but I moved it around after some encouragement from my editors. It was the first line that came to me in the story; it still feels like the first line, as much as I love the final first line. One of my biggest challenges when planning out this book and the sequel was figuring out how to juggle several major plotlines. (Rebellion, wraith, vigilante, kingdom... Not to mention Wilhelmina's internal plotlines.) I knew they all had to run concurrently, too, which proved another difficulty, given I had only one character viewpoint. I was really afraid the story would come out lopsided, but by the time I turned in the final draft, I was really proud of how it held up. I'm finishing up the last of the production work on OQ2, as well as edits on the four novellas HarperCollins will be releasing between the two novels. I have another project on the side, but I shouldn't say too much about it yet. Jodi Meadows lives and writes in the Shenandoah Valley, Virginia, with her husband, a Kippy*, and an alarming number of ferrets. She is a confessed book addict, and has wanted to be a writer ever since she decided against becoming an astronaut. She is the author of the INCARNATE Trilogy and the forthcoming ORPHAN QUEEN Duology (HarperCollins/Katherine Tegen). Visit her at www.jodimeadows.com *A Kippy is a cat.